This sophisticated, anti-glare digital picture frame is so advanced that it doesn’t even look digital. The matte finish makes artwork appear like it was painted on a traditional canvas. Showcase your own pictures on Meural or any of the 30,000 works of art that are accessible in Meural's database. The statement size gives it a stunning presence, too. Invented by former college buds and art experts Vladimir Vukicevic and Jerry Hu. The two gathered feedback from an artist collective to fine-tune their design, which includes an ambient light sensor and 8GB of memory, and so you know it's gallery-approved! Setting it up and syncing your own photos is intuitive. You can change up the display from an app on your your phone or gesture with your hands. Whether it’s a Van Gogh or a picture you captured in your travels, Meural is truly befitting of any beautiful works of art it displays. Is version 2.0 now available? Will there be a charge for future upgrades? Any free upgrades to the software will be pushed to your device automatically. When a new version of the canvas is available, it will have to be purchased separately. If I buy two Meurals for two different rooms, will the app be able to operate each one separately? Yes, the app will be able to operate each canvas separately. VERY cool idea! Considering the quality of the image, and the beautiful wooden frame I'm sure it is worth the price, I just can't afford one right now. I understand being past the stage of posters on the wall. This is a fabulous remedy for that. Getting to see works from well known artists all the way to the up and coming is so neat too. I'd love to spend time in art museums but there aren't any near where I live. This would be like a constant trip to the museum. Are you considering different sizes in the future?? @Shanna thanks for reaching out! Right now we only offer the one size, but do plan on expanding our product line (including size options) in the near future! Hi, it says it comes with a power cord and charger. What's being charged? Is it battery powered? @Brian Hi Brian! The Meural Canvas is powered by a power brick, which remains plugged into a wall outlet at all times. Excellent product idea! Have been looking for something like this for a long time. Question: the product description says something about a power cord. Does the frame itself, like a tv, need to be plugged into a 110 outlet? The reason I ask is, the place I want to hang it on my wall doesn't have acces to a power outlet, and I really don't want an ugly power cord/extension cord hanging down the wall from it. Can you describe the power connection please? @DeAnn Hi Deann, unfortunately the Meural does need to remain plugged in. A lot of our customers will wire the cord through a wall so that it remains hidden and discreet. @E.C. Ok, that's a possibility in my application. Thank you! @DeAnn we currently do not have a strict warranty. However, we are quick to fix any issues that arise by either replacing the unit or paying to ship the unit back to our HQ in NYC for it to be fixed by our tech team! This is a learning and growing process for all of us and we want to keep everyone happy. So glad you recognize the real "value" of customer service these days. Thank you! Wondering if there is additional cost to download from the digital database or is this included in cost of meural. Can you provide more information on available images. What are specs required to upload your own images?? 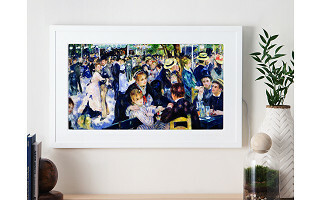 @amy Hi Amy, when you purchase the frame, you gain instant access to our collection of over 30,000 pieces of art. This ranges from the Mona Lisa to modern day gif art and street art. All work is licensed and paid for, but included in the purchase of your frame. my.meural is our online database that you link your frame to via wifi and can explore and sync pieces to at your leisure! @E.C. How may pictures/photos can be held on the units hard drive? And, are there requirements of the photo that can be uploaded ? ie. mega pixal requirements etc. @Paul Hi Paul! Thanks for reaching out. The frame can hold 3,000 images at a time. We've found that the images that look best on our screen are 1920:1080 px for vertical and 1080:1920 for horizontal. @E.C. Well honestly the art is great but I'm thinking of this as a gift to grandma. So I'd like to fill it with family photos. What's the procedure for that and how many photos can it hold. @Frank we have an online platform that you use with the frame to download the art and sync it to the frame. It is the same procedure for family photos. 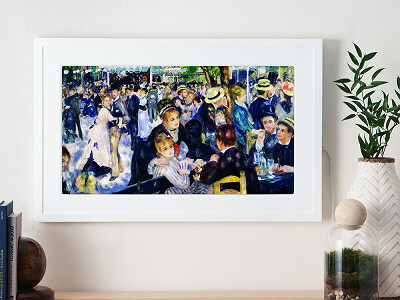 You simply upload them onto my.meural, and then create a playlist and sync it to the frame! @E.C. Okay, but once again what's the guess on how many pictures in a playlist. I imagine there has to be a memory limit. @Frank Sorry I missed that the first time around! The memory limit is 4GB, so that's where we get the estimate of 3,000 images divided up into different galleries and playlists. But, there is no limit on a quantity in a specific playlist. I'm wondering about longevity - does it have a motion sensor to turn off the screen when nobody is in the room, or does it remain on 24/7? If I want one to display my own photography, is there a lower price point to opt out of paying a share of the license fees for the curated collection? If I get another one to display the curated collection, does the online portal allow for automatically switching pieces from a "playlist" on a daily, weekly or monthly basis? @Gary Hi Gary! Under "Canvas Settings," you can set different sleep schedules for your frame. So, when you're at work and no one is home the frame can rest. This extends the life of the frame exponentially. Within the timeline feature you can also schedule different playlists to come on during certain times during the day, or even at random. You can do this with your own content as well, not just ours! The price point is the same. This sophisticated, anti-glare digital picture frame is so advanced that it doesn’t even look digital. The matte finish makes artwork appear like it was painted on a traditional canvas. Showcase your own pictures on Meural or any of the 30,000 works of art that are accessible in Meural's database. The statement size gives it a stunning presence, too. 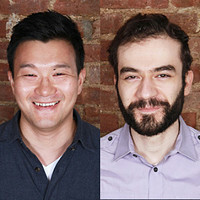 Invented by former college buds and art experts Vladimir Vukicevic and Jerry Hu. The two gathered feedback from an artist collective to fine-tune their design, which includes an ambient light sensor and 8GB of memory, and so you know it's gallery-approved! Setting it up and syncing your own photos is intuitive. You can change up the display from an app on your your phone or gesture with your hands.